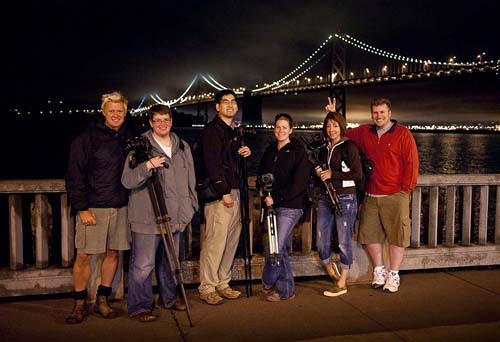 Our night owl workshop group met at Baker Beach at 6pm to embark on a tour of locations for learning photography, taking great shots and having fun. San Francisco, known for it's fog, did not dissapoint. As we did our traditional meet and greet the fog enshrouded the Golden Gate Bridge and it felt like we were standing in a cloud! However, this was good news! We knew with the fog so low and thick, that the bridge would most likely be visible from the Marin Headlands so we loaded up and headed over the bridge. Sure enough, we exited and headed up the hill above the headlands and there was the Golden Gate, rising from a blanket of heavenly looking fog. We quickly made our way to the point, setup and began our class. The fog rolled through quickly, constantly changing the scene and this made for some really great photography. Students began by finding a good aperture and shutter speed to achieve quality exposures, then we shuffled around looking for different compositions, both horizontal and vertical. Eventually, the fog covered the entire bridge but that was fine, we had already gotten some great shots so we loaded back up and headed into the heart of San Francisco...next stop, the Palace of Fine Arts. About two minutes of arrival, walking around the pond, we spotted a mother duck with five brand new baby chicks. They were tiny, and very cute...and best of all, they were in the water near the path so everyone got down low and captured some great wildlife shots before mother duck led them away. We then setup directly across from the dome of the palace and spent the next hour working on how to control our cameras and how to be creative with unique compositions and exposures. During this time the sun had set and we were now in the blue hour, then the lights of the palace came on and it was show time! The best light of the day and the images showed it. Three and four second exposures allowed us to capture a nice lit reflection in the water and made for a mirror like image. Pretty cool! From the Palace of Fine Arts we headed up the very steep hills of San Francisco to one of the most famous streets in the world...Lombard Street. Now it's nice and dark and the true night shooting has begun. We worked on 15, 20 and 30 second exposures, capturing the car lights as they made their twists and turns down one of the crookedest streets in the world. The long exposures were really turning out nice with the great light of the night so we stayed a little over an hour...with every image different than the last. The students really enjoyed this spot, and for good reason. Next stop, The Embarcaderro. From the Ferry Buiding area we had clear views of the Bay Bridge and we used this location to capture some wide angle views of the Bay Bridge as it spanned the bay onto Treasure Island. And speaking of Treasure Island, that was our last stop of the night. The fog was beginning to creep into the city so we hurried to setup and get some final cityscape images before the fog would eventually engulf the city. What a night...we recounted as we made our way back to the meeting location so everyone could head home after a fantastic night of shooting.